Perhaps you've been following the criminal trial of former leaders of disbanded law firm Dewey LeBoeuf LLP. The prosecution contends that these leaders purposely misled other stakeholders, including equity partners, bondholders, and the general public as to the firm's fiscal health. Law360 reporter Andrew Strickler recently asked me whether such shenanigans are standard practice. After all, if everyone does it, and if there's no standard for financial reporting, is it wrong? You can read "BigLaw Fee Antics Persist Despite Dewey's Cautionary Tale" and many other articles related to the Dewey trial here. I'll offer some brief elaboration on my comments. First, it may be helpful to have the fastest lesson ever in law firm accounting. Most law firms operate on a cash accounting basis -- simply put, when a client sends a check, it's counted as revenue. When the law firm spends money or a lawyer records time, it's counted as an expense. A lawyer doing work for a client today, and incurring expenses on behalf of that client tomorrow, might not get paid until many months after. At fiscal year end, the firm's total expenses recorded for the year are subtracted from all the revenues collected, and what remains is the firm's annual profit. So revenues associated with a specific matter might fall into next year even though much of the expense was counted this year. Most companies, however, operate on an accrual accounting basis -- for reporting purposes, revenues and expenses are recorded according to certain trigger events. So the company might sell a product with 12-month payment terms. The entire revenue is "booked" at the time of sale even though the actual cash flows in over a much longer period. This approach allows business leaders to gain insights into financial performance without worrying about timing issues. Of course, in the example above some buyers default so there is a process to reconcile what we booked with what we actually received. It may also be helpful to understand that good "fiscal health" is often loosely defined as a track record of generating increasing revenues and profits every year, generally without huge peaks or valleys. Many investors like certainty. Of course, business is unpredictable. Higher returns tend to require higher risks. So when investors, or market analysts whose job it is to advise investors, demand consistent performance year in and year out, they often mute the performance of companies that are inclined to gamble less. Many business leaders act conservatively, seeking a predictable annual growth rate rather than making bold bets and possibly generating leaps in income. Investors with a high tolerance for risk expect much bigger bets and much larger returns, and are willing to accept bigger misses. In a law firm setting there are no external institutional investors, but there are partners (who are equity shareholders), staff, potential recruits, clients, and competitors who all serve as stakeholders. Show weakness or fiscal instability and competitors will pounce, clients may hedge their bets by shifting work elsewhere, and lateral recruits with sizable books of business will get cold feet and seek stability elsewhere. So law firm leaders tend to want to project an aura of fiscal stability, of endless, solid, stable growth through good times and bad, regardless of economic or competitive conditions. Whether a company relies on accrual accounting or a law firm relies on cash accounting, its leaders can be tempted to play with the timing of events to smooth out peaks and valleys. While these leaders may have good intentions, "income smoothing" is, by and large, unethical, and most likely illegal when it reflects a purposeful intent to use creative accounting to present a false picture of financial performance. Studies have also demonstrated that, in the long run, income smoothing negatively impacts performance. I have no particular insight into Dewey's financial performance or accounting practices during the period immediately before its demise, but there are numerous techniques I've observed by other organizations elsewhere that suggest purposeful income smoothing. Perhaps the law firm has already met its financial targets for its January to December fiscal year and a few more checks arrive in the mail in the final days. If it sits on the checks for a little while before depositing, the revenue is recorded in the following year, giving the firm a headstart. Or perhaps a friendly client will send a check in December with a January date, allowing the firm to record the revenue in one fiscal year but actually cash the check in the following fiscal year. The reverse also happens, a client sends a back-dated check -- it arrives in January with a December date, allowing the firm to pretend the check arrived in time to count in the earlier period. The same can happen with expenses -- making a lease payment early, say paying the December rent on December 1st and the January rent on December 30th, in order to reduce the coming year's expenses. "But wait," you might say, "If we have extra income and we want to pay the rent early, isn't that a sign of good fiscal health?" Sure, it could be. But when the intent is to specifically disguise actual financial performance and it results in stakeholders making poorly-informed decisions, then it's more nefarious than prudent. Imagine if firm leaders delayed recording fee receipts for a specific partner by ensuring that all expenses are recorded, and accelerates some expenses from January into December, with the net effect negatively impacting the partner's performance metrics so that his colleagues demote him to a lower equity tier and he earns significantly lower compensation. Or imagine that firm leaders offered several compensation guarantees to new lateral recruits but hid this from other partners, disguising these contractual payments as travel expense reimbursements. You can see that a lack of financial controls can create a slippery slope where even an honest and good-intentioned leader might tweak some figures to address some short-term issue, with the expectation that everything will work out over time and no one will be the wiser. And sometimes it does. But, just as with gambling addicts, sometimes a tweak here or there that doesn't pan out leads to even bigger bets "to get caught up and then I'll stop." That same lack of controls can tempt bad actors into specifically defrauding shareholders and other stakeholders. Sadly, too many law firm partners aren't given access to detailed firm financial information, or they are too disinterested to request access, or are given access but don't have a clue how to interpret the results. Some have argued that forcing law firms to use the accrual accounting method will help improve transparency -- but this move is not without consequences. Others have argued that law firms, despite being private enterprises, should release periodic public financial reports. One way or another, demystifying law firm finance and perhaps adopting more transparent approaches will serve the profession well. 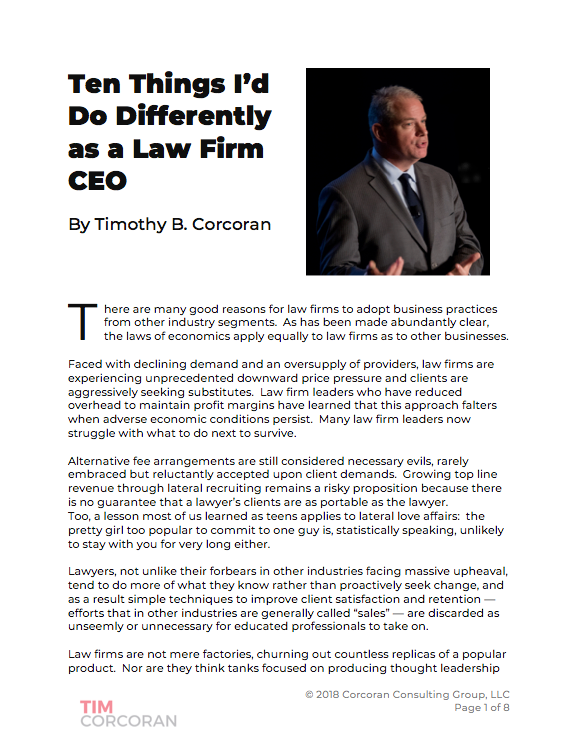 There may not be readily available statistics on how prevalent income smoothing is in law firms. But perhaps all we need is a smell test: Do you know how your firm accounts for revenues and expenses? Do you know if and when and by whom these practices are audited? Do you have absolute faith in your leaders' integrity? Does the position description for firm leadership require finance or accounting training? Are there sufficient fiscal controls in place to prevent one bad actor from wreaking havoc? If you don't know these answers, it doesn't mean there's a problem. It just means you'll be the last to know when there is.